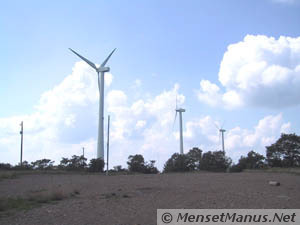 I went to see the state of the environment where the wind power plant will soon be expanded. The approximate path of my wanderings is in orange on the map, which is from page 2-6 of TVA's environmental assessment for the plant expansion. 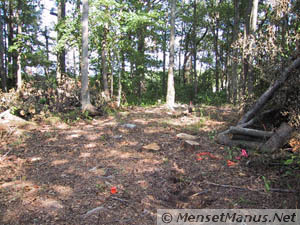 I may have eventually stumbled upon the actual spot (ground zero) where a new windmill will be located, and where trees are being cut down to make room. Since my last visit, some things remain about as they were, some things have changed for the worse, and a few things have improved. 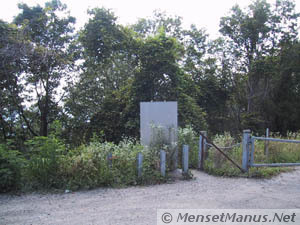 The first photo is from a year or two ago, at the gate blocking the main road to the power plant. I previously showed this sign in detail. Next is the current condition. 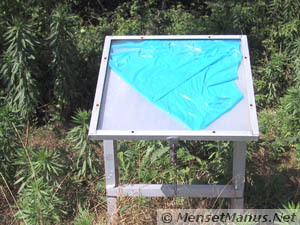 The information has been removed from the sign, but I don't know why. 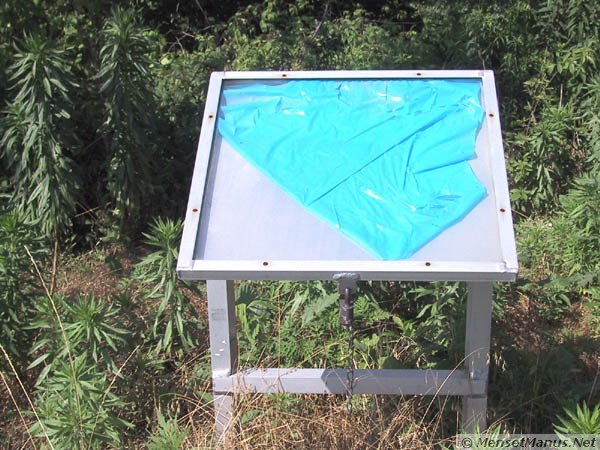 It may have been vandalism, or TVA may have decided the sign contained too much information or it was no longer current. 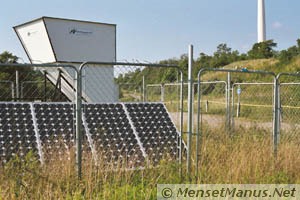 Certainly, the predictions of generating 6 million kilowatt hours per year were overly optimistic according to the data. A short distance past the barrier, to the right, a trail or narrow road heads up the hill, away from the windmills. 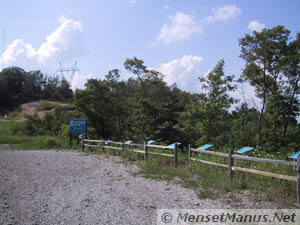 This photo shows the view looking back down the trail towards the road. 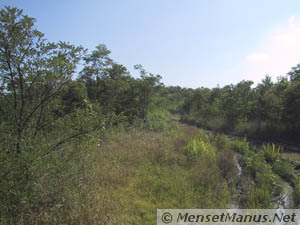 The trail is not overgrown, but there are many trees and bushes growing next to the trail. 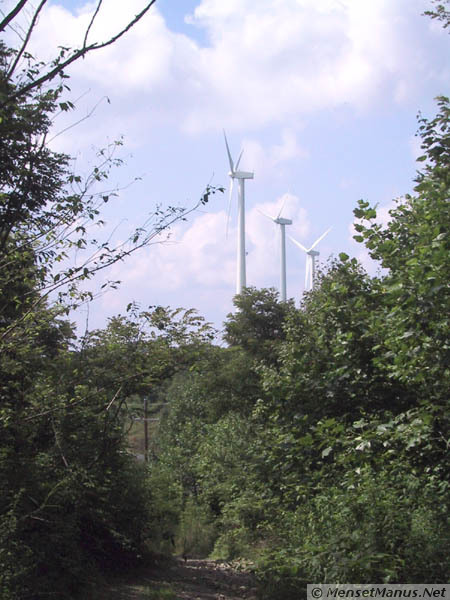 Although I don't know the exact location of the future windmills, the tentative, approximate locations are shown on the previous map, and it is likely that some of these trees and bushes along the ridge will be sacrificed to install the new windmills. 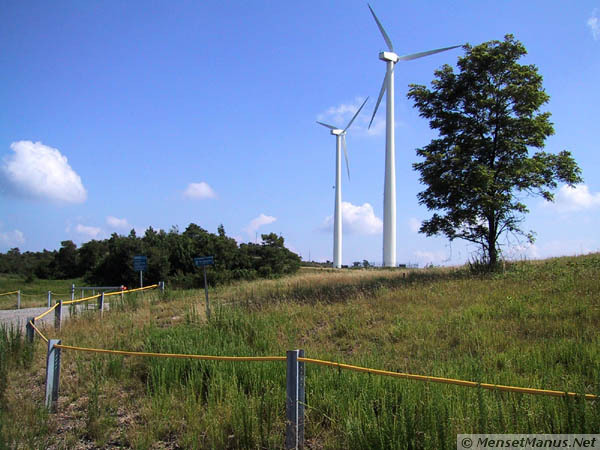 This plan is described in the previously mentioned environmental assessment, which says, "A permanent gravel access road about 16 feet wide would be built along the length of the row of turbines. An area of about one acre would then be cleared at each turbine site to provide room for assembling and installing the turbine components" (page 2-2). 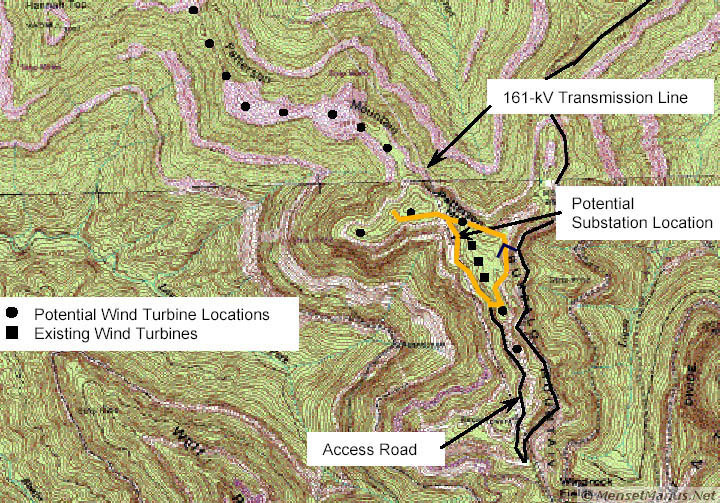 Later, the assessment says, "The appearance would change from a strip mined mountain top and existing small windfarm to a larger windfarm of similar character extending about 2 miles along the ridge. 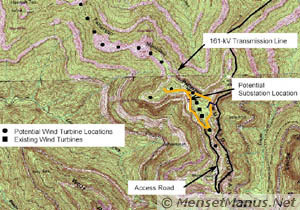 Visible construction would include about an acre of ridge top vegetative clearing around each turbine along with excavation, airborne dust, cranes and structure erection, crushed stone parking and fabrication areas, material stockpiles, other temporary facilities, fencing, and site reclamation" (page 4-28). 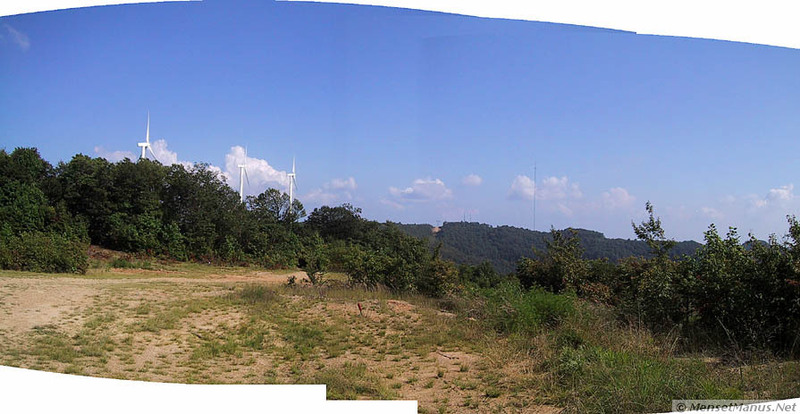 Along the ridge, or the "strip mined mountain top," as TVA calls it, the top of one windmill is barely visible over the trees, which line both sides of the narrow dirt road. Continuing along the ridge toward the power plant, the road opens up into a cleared area. Presumably this would be a good spot for some of the new windmills. 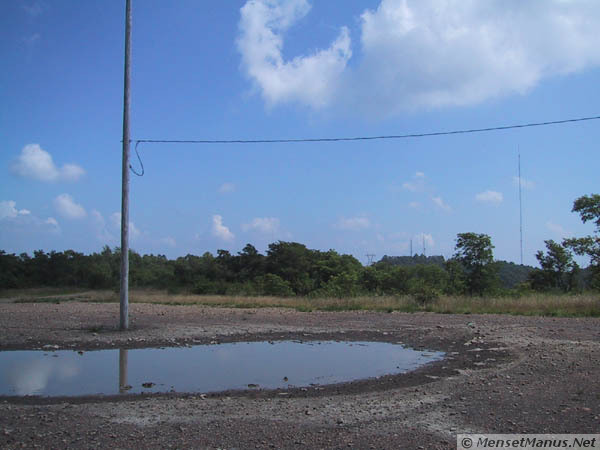 Notice the two telephone poles in the distance (to left of center). A short distance beyond the telephone poles there is a drop-off down to the windmills. 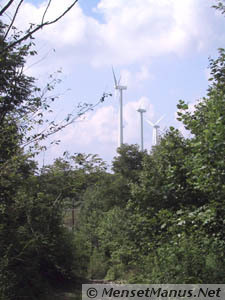 Between the telephone poles mentioned above, and the windmills, looking back away from the windmills, trees are seen covering the ridge in the distance. 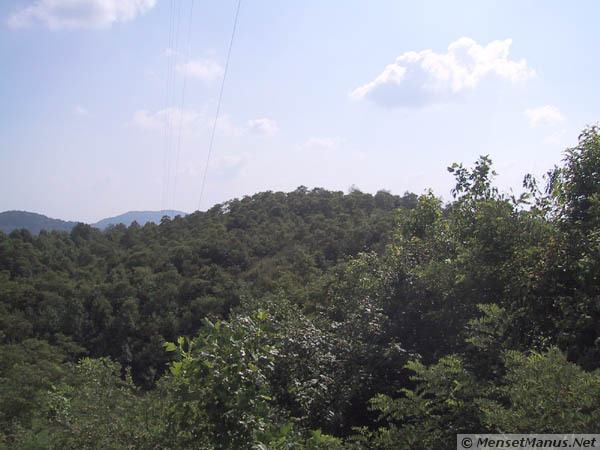 The communication center's very tall antenna (about 1000 feet high, from page 3-40 of the Environmental Assessment) is barely visible at the right side of the photo. A yellow, plastic-covered cable fence, with gated openings, now completely surrounds the power plant to keep out unauthorized vehicles (below). 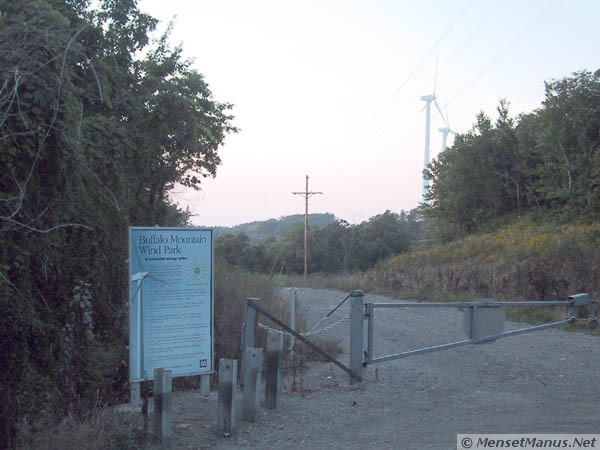 Beyond the windmills, at the other side of the power plant, is another tree-covered ridge, which will soon be home to more windmills, according to the map above. 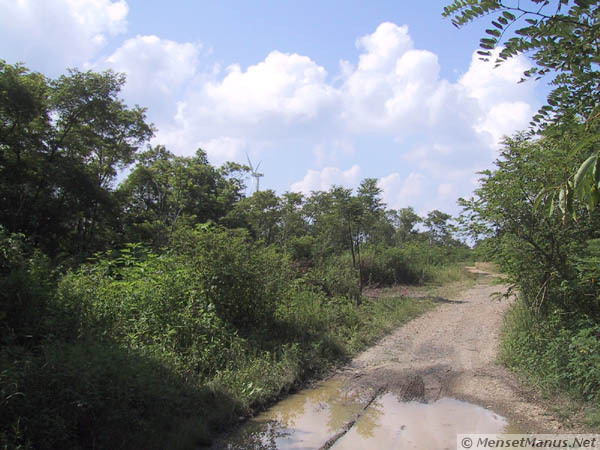 Except for the well worn gravel roads used by TVA and recreational ATV riders, a likely benefit of the plant is somewhat reduced wear and erosion in a few places inside the fence. The large tree seen in the photo looks to be growing quite well, but obviously it was there before the power plant, and probably won't be allowed to grow enough to block the wind. At the same time, the gravel roads installed for the power plant are staying well worn, and mostly clear of growing plants. From a distance (below) one might mistake the blue panels for solar power panels or informative displays; however, on closer inspection, they are empty and apparently neglected. The larger, blue sign (better photo here) is at the northern end of the current power plant site, where I used to park until TVA started blocking the access road. In the distance, beyond the transmission line and to the left, one sees another area where windmills will be located to the northwest of the current power plant. 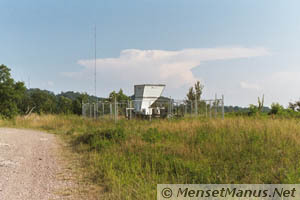 The top of the weather tower is also barely visible above the trees, just to left of center in the photo. The sign on the box says "WIND TURBINE INFORMATION," but again no information is provided (here or on request). By the way, I am not responsible for either the bottle or the bees' nest, and I left the box closed (as I found it) after looking inside. 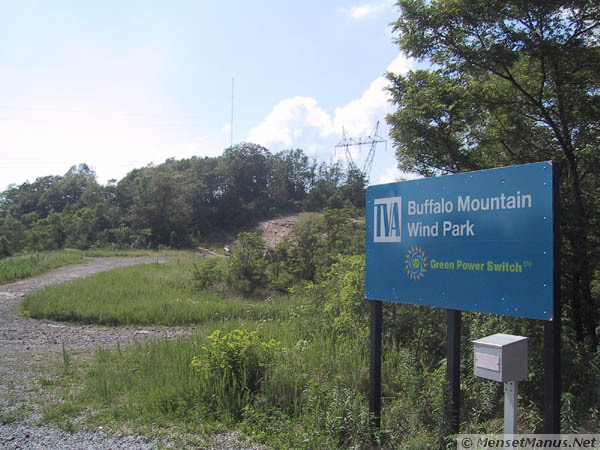 TVA has refused to release detailed power production data, which would illustrate the true details of the intermittent nature of wind power. During my walk I was witness to 15-30 minutes (or so) of obvious zero power in the "No-Spin zone." As hot and sunny as it was on this late July afternoon, I really would have enjoyed more breeze, so it caught my attention when the windmills completely quit spinning. 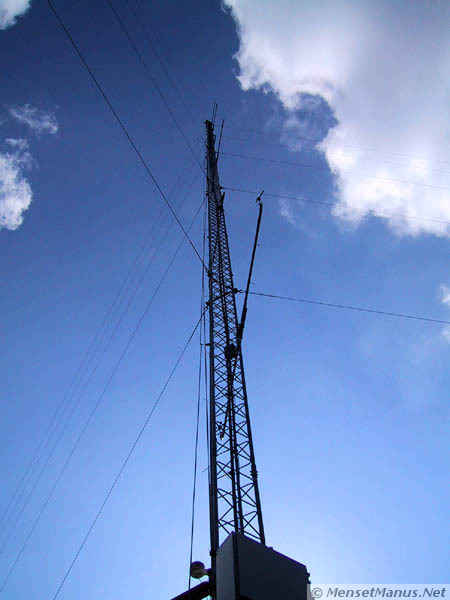 The weather tower is very tall (200-300 feet? ), and provided a little welcome shade in the heat. The dirt road to this location is well worn, and the area around the tower is kept cleared. 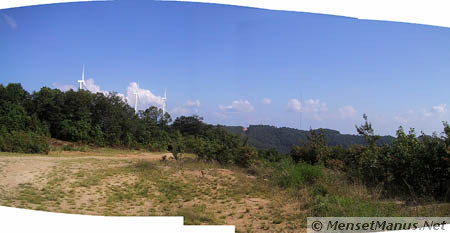 Looking beyond the weather tower, one sees more tree-covered hills where more windmills will probably be installed. The tower support wires are barely visible in the photo. 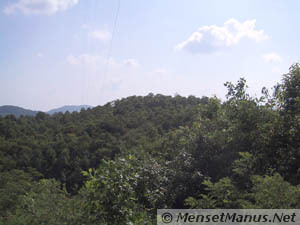 From near the weather tower, looking back towards the power plant, an opening in the trees can be seen, near the reddish colored area, across the dirt road, and near the left of the photo below. In the opening in the trees, in the middle of an area of thick, tall trees, is found the likely planned location of a new windmill. Several trees were already cut down, and stakes are in place, apparently to mark ground zero. 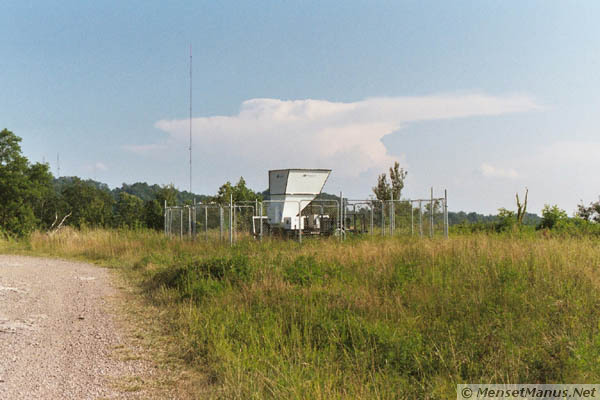 I turned around a short distance to the north of the weather tower. 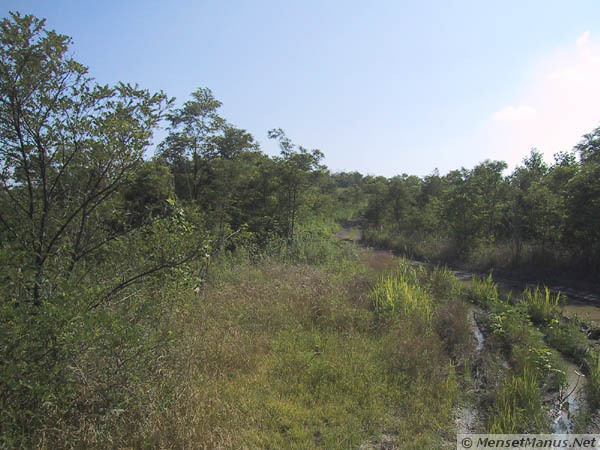 The trees are not very tall in this area, but they have a good start, and the ground cover is already quite thick. 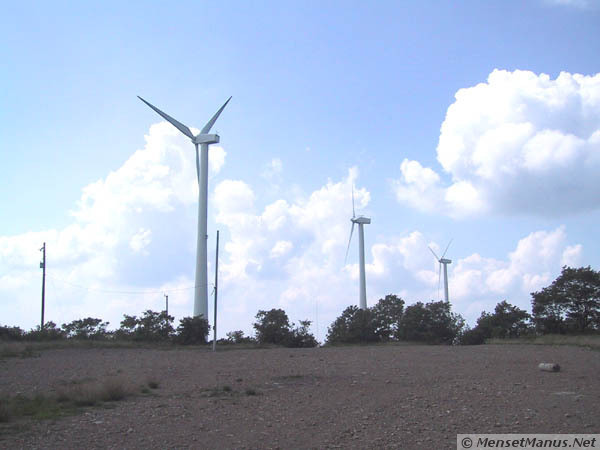 We will see what environmental benefits the new windmills will bring to the area. I noticed a few more things during the long walk back to my SUV. 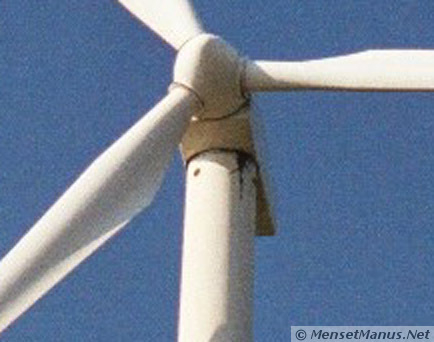 The windmill blades looked a bit dirty, despite plenty of rain this summer, but dirty blades are nothing new. It might have been my imagination, but I could swear the south-most windmill was spinning noticeably slower than the other two, and I heard an occasional loud "thunk" noise coming from one of the windmills. 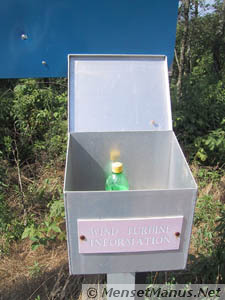 Somebody had brought in a miniSODAR system from Aerovironment, Inc., in Monrovia, CA to measure wind speeds in the area using high frequency sound (Updated information is now available here after sale to MiniSodar.com). I wonder what effect that had on the local bat populations? The miniSODAR rig, which is mounted on a trailer and transportable, has solar panels, so it fits in nicely with the "green" power theme of the windmills. Ford and Arthur on Vogon poetry: "I thought that some of the metaphysical imagery was really particularly effective. And er ... interesting rhythmic devices too, which seemed to counterpoint the ... er ... er ..." "counterpoint the surrealism of the underlying metaphor of the ... er ..." "... humanity of the ..." "Vogonity." "Ah yes, Vogonity (sorry) of the poet's compassionate soul, which contrives through the medium of the verse structure to sublimate this, transcend that, and come to terms with the fundamental dichotomies of the other, and one is left with a profound and vivid insight into ... into ... er ..." "Into whatever it was the poem was about!" I last touched this page on Saturday, 2007-11-17 at 05:08:59 UTC.